There is some skepticism about the viability of large scale reforestation. People desire to eat, producing food takes up land. People also need a diet with high quality protein, so we could imagine that meat production is perhaps simply the most cost-effective way we have of producing such protein. As I will go on to show however, we could provide our dietary needs using a fraction of the land we use today. The problem in this regard mainly comes down to cultural and political factors. Let us take for example, the production of meat. The beef cattle industry is estimated to produce 19 kg of protein per acre per year. In Ireland, the rope mussel industry, produces 95 tonnes of mussels per hectare, per year, which is 38.44 tonnes per acre. The meat yield of this is estimated at 28%. Mussels without their shell have a protein content estimated at 17%. The result is that rope mussel farms can produce 1.829744 tonnes of protein per acre, or 1829 kilo, an estimate three orders of magnitude higher than meat production. This is in line with an estimate given here. If we assume that we have sufficient places to grow mussels, how much land could we give back to nature, simply by replacing all meat production with rope mussel production? A total of 26% (3.4 billion hectares) of the world’s ice free surface is used for grazing. In addition, one third of arable land is used to grow feed crops. Arable land constitutes 9.3% of the world’s land area, a third of which would be 3.1%, meaning that hypothetically, we could give around 30% of the world’s ice-free surface back to nature. The environmental impact of this would be minimal. Mussels can actually solve a major problem we are dealing with, of eutrophication of our coastal waters. The bigger problem is getting people to swap a steak for a little critter in a shell, or getting the meat industry to pay for the negative externality it imposes on our environment, which would help make the mussel look a lot more attractive to consumers in the local supermarket. Of course we are still operating from the underlying assumption here that animal protein in our diet needs to be substituted, rather than simply reduced. A valid argument can also be made that we would benefit simply from reducing our meat intake and increasing our plant food intake. The protein per acre from plant foods is still higher than the protein per acre we can derive from meat. One study estimated that replacing 25-50% of Europe’s meat intake with plant foods could reduce our land use by 23%. The question that should occupy our minds however, is why people don’t. One factor that appears to attract people to a diet high in meat is because a plant-based diet leaves them feeling unsatisfied. It appears to me that this problem is mainly a consequence of lysine deficiency in the typical plant based diet. The typical limiting amino acid in cereal grains is the amino acid known as Lysine. The RDA for lysine is 38 mg/kg per day. A group of vegan women had an average lysine intake of 30mg/kg per day, thus the average vegan woman was deficient in lysine. The vegan response to this is to diversify the diet and include more legumes, but there is a better solution, which consists of increasing the protein quality of the diet, through fermentation. Until we began to produce bread using yeast, most of our bread was fermented by naturally ocurring lactobacillus and yeast strains. These same Lactic acid bacteria live in the rumen of a cow, where they produce lysine. We could theoretically see our herds of cattle as a very inefficient method of grain fermentation. When we ferment our grains, producing sourdough bread in the process, the lysine content of our food increases tremendously! Lysine content in wheat quadruples upon natural fermentation, as humans used to practice for generations. This process works in maize and rice as well. We have to wonder whether it is coincidence that animal protein as a portion of the Western diet began to grow as sourdough bread simultaneously disappeared from the diet. When we feed our cattle, we tend to feed them soybeans, the reason being that soybeans produce large amounts of protein per hectare, at 263 lbs per acre, compared to 75 lbs for wheat. Soybeans are somewhat controversial as a bulk part of the diet for humans, because of their high phytoestrogen content. It’s unclear what the effect is of exposing humans to high amounts of phytoestrogens. Fermentation can be used to reduce the phytoestrogen content. Historically, soybeans do not appear to have been a large portion of the Eastern diet. There’s another crop out there however, that has the potential to drastically increase our food production per unit of land. This crop is known as hemp. It has been used for thousands of years, since the start of the Neolithic revolution. It’s still used today on a wide scale in North Korea. Besides producing large amounts of seeds that are high in protein, hemp has traditionally been used for its fiber. The main reason it is hardly used for this purpose today appears to be because although it produces large amounts of useful fiber, the fiber is only found in the bark, which makes the process of producing paper and other products using hemp relatively labor-intensive. Innovations may be possible that make hemp cost-effective in more domains, but sadly, these innovations were prevented by hemp’s status in the 20th century as a forbidden crop, due to the efforts of William Randolph Hearst, who owned newspapers as well as having an interest in forestry industry. How much potential does hemp have to feed the world? Unrealistic estimates can be found on the internet, of 8 tons of seed per acre. A more realistic estimate seems to be given here, of 873 lbs per acre globally. Taking our 873 lbs per acre estimate of seed production and assuming a 23% protein content for our seeds leaves us with 201 lbs of protein per acre. This compares favorable with wheat, but not with soy. Of course it has to be pointed out that hemp and soy are not grown on similar fields, as hemp can grow in relatively high latitudes, where soy can not. Most hemp is grown in China, where yields are estimated at 1,606 pounds per acre, which would be 369 lbs of protein per acre, easily beating soy. If we then consider that seed hemp delivers secondary products that could be utilized, hemp begins to look like a very interesting option. The main problem we have is that our societies are averse to labor-intensive methods of agriculture. If land ownership were adequately taxed, more labor intensive use of a comparatively smaller amounts of land would become more economically competitive, which would probably benefit crops like Hemp at the cost of crops that have a relatively low yield, but require very few workers. Interesting to note here in my personal opinion is that our society has a fetish for “job creation” which serves as an justification for a variety of polluting industries, but the fetish for job creation typically ends as soon as we talk about agricultural reform and decentralization. Some estimates for the carbon footprint of mussels can be found here. It is estimated that the suspended mussel has a carbon footprint of 252 kilograms of CO2, to produce one tonne of mussels. This is ridiculously little, when we compare it to the conventional meat industry. Producing one tonne (1000 kg) of red meat will release 22.000 kilograms of CO2. 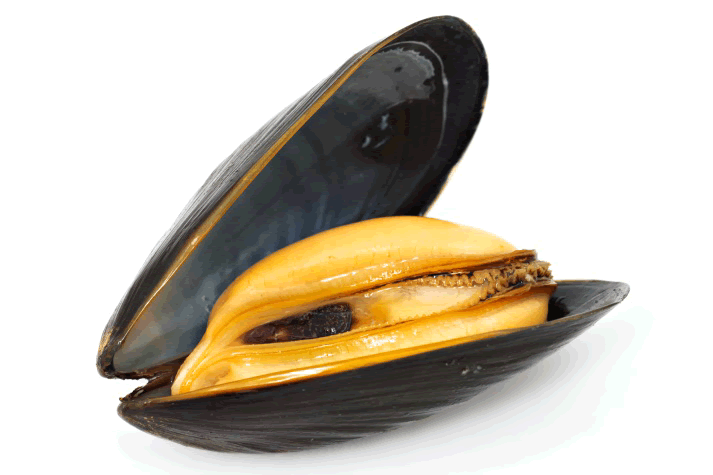 In other words, the humble mussel has a carbon footprint estimated at about 1% of red meat. Important to note is that shellfish are capable of sequestering carbon dioxide. The shell of the mussel is made of calcium carbonate, which features one atom of carbon per molecule. It is estimated that the mussel sequesters 192 kilograms of carbon dioxide per tonne of harvested mussel, out of which 12 kilo fall into the ocean. In the UK, a large number of these shells end up on landfill sites, where the carbon thus remains locked in the shells. About a quarter of the mussel shells will end up incinerated as waste, which can be considered renewable energy. The question we should ask ourselves is: How much carbon could we theoretically sequester using mussels? Globally, 308 million tonnes of meat are produced per year. Because the meat yield of a mussel is 28%, 1100 million tonnes of mussels would have to be harvested per year, to produce the equivalent amount of meat. This means that mussels would sequester 211 million ton of carbon dioxide per year, which is slightly less than one percent of yearly global emissions. Using our earlier figure of 95 tonnes of mussel per hectare, we know that growing 1100 million tonnes of mussels would require 11.5 million hectare. How much land is that? The world has a total land area of 51.000 million hectare. So, we could theoretically replace all meat consumption in the world using 0.02% of the Earth’s surface. Feeding the whole world would take more surface area, but not a whole lot. There are obviously some constraints that limit how much of the world’s surface we could turn into mussel farms. We need to use areas near the coastline, as areas far away from the coastline will have a higher carbon footprint. Toxic algae blooms may prohibit us from growing mussels in warm water, while very cold waters may have low productivity. Some areas may be too polluted by industrial activity. We’re generally only used to eating salt-water mussels, but fresh-water mussels are actually edible as well. Still, finding 0.02% of the Earth’s surface should not be overly challenging. In theory we should be capable of significantly increasing our food production, simply through more efficient resource use. Resources are currently misallocated, both through entrenched cultural practices and our failure to properly account for negative and positive externalities imposed by different methods of food production on our environment. As long as a boost in our food production would not be accompanied by a boost in population, it would be desirable to radically change the nature of our food supply. People would eat a plant based diet, with fermented cereal grains as a bulk portion of their diet and farmed mussels as their main source of animal protein. This would allow us to drastically cut our greenhouse gas emissions, reforest most farmland and thereby begin drawing down significant amounts of carbon dioxide from the atmosphere and create habitat for endangered species. It would even cut our healthcare expenses as an unintended benefit. Of course I’m perfectly aware that the above isn’t going to happen anytime soon. There are political factors here that pose a problem, one of which is the emphasis we place on individual rights. People don’t particularly like to be told what to eat. In addition, politicians, who are typically given a mandate for four years, don’t have an interest in radically changing our standard of living in the coming years, to prevent a disaster that may unfold decades from now. To illustrate the problem of individual rights, consider the hypothetical case of a society that believes that no child should go hungry, nor that anyone should be told they’re not allowed to have children. Such a society would continue to witness population growth until it faces a classical Malthusian catastrophe. After all, even if 90% of the population refuses to have any children because of their recognition of the concept of carrying capacity, the remaining 10% who through genetic predisposition, religious persuasion or any other factor tend to have many children would grow to become the majority of the population. In the Western world, we greatly value what we perceive as human rights, because our culture places great emphasis on the individual and his desires. In other cultures, collective punishments and seemingly arbitrary taboos help address some types of problems that we have no effective way of responding to. An example would be China’s one child policy, a policy that’s politically unacceptable in the Western world but an effective method of addressing some of our problems. This isn’t going to change anytime soon. If anything, the Western concept of individual rights is spreading to non-Western societies, rather than the reverse. An argument can be made that China’s one child policy merely delays the inevitable point where we burn all fossil carbon we can exploit, but even if this is true, delaying the inevitable would already be a significant success. Oceanic organisms would have more generations to genetically adapt to ocean acidification. The current rate of ocean acidification is thought to be faster than any previous episode during the past 300 million years. Organisms on land would have more time to migrate away from the equator. The big problem we face is that it’s difficult for us to escape the maximum power principle, the phenomenon whereby the principle of natural selection favors systems that continue to grow and utilize ever more resources, even if such short-term growth were to lead to their long-term demise. This is a problem, because technology allows us to utilize resources that other organisms can’t access, or to utilize resources in ways that are profoundly damaging to the ecosystems we inhabit. Thus although it should be physically possible to give most of the world back to nature while feeding seven billion people, it’s probably politically impossible. However, if discussing this topic leads some policymakers to shift agricultural subsidies more towards mussel production, or if individuals respond by eating a diet that’s high in mussels and fermented grains yet low in red meat, that would already represent a potential improvement of our situation. It seems to me that someone on a vegan or a vegetarian diet out of environmental considerations could already further reduce the portion of the world’s land he uses, simply by incorporating farmed mussels into his diet. Personally, I practice a vegetarian diet that includes mussels and sourdough bread. You might also be interested in leaf protein concentrate (https://en.wikipedia.org/wiki/Leaf_protein_concentrate). According to one paper, alfalfa could yield 300 pounds of protein per acre (http://link.springer.com/article/10.1007%2FBF02904274#page-1). While this is less than the mussel figures you are quoting, I wonder where all of the nitrogen for these mussels would come from. Currently, most of it comes from Haber-Bosch somewhere down the line, but the alfalfa would be fixing its own nitrogen. I really enjoyed the article! For a work of fiction exploring similar ideas, I recommend Tuf Voyaging by George R.R. Martin. Thanks. The nice thing about growing mussels is that they can grow in ecosystems that currently have excessive nitrogen because of nitrogen released by our agricultural practices, revitalizing these ecosystems in the process as a positive externality. It is also somewhat unwise to “put all our eggs in one basket”. If we were truly dependent on a small geographical area producing most of our food, and that food was mostly a single species, one disease of mussels could be catastrophic for us. So diversity of food production is essential. Have you thought at all about permaculture? Personally I am planning a subsistence agriculture based on nuts (chestnut, pecan, hickory, black walnut, hazelnut), fruits (persimmon, apple, asian pear, sea buckthorn, etc), and perennial vegetables (sea kale, hablitzia, sunchoke, apios americana, violets, asparagus, etc). Chickens would be part of the equation as waste processors. This has the effect of reforesting land as well as providing food. I’m familiar with Permaculture yes. I’m supportive of it, but it is important to recognize the value of large swathes of lands that are not under cultivation by humans.